Some foods may trigger symptoms. A diet for hiatal hernia can make living with the condition easier. Following guidelines and having regular medical examinations are important aspects to treating the condition. Hernias are protrusions, in which one part of the body has a gap that opens into another part of the body and as a result sticks out of the opening. In cases of hiatal hernia, the opening is in the diaphragm where the stomach meets the esophagus. A gap in the diaphragm allows part of the stomach to protrude through the opening. Many people have hiatal hernias without ever knowing it. Small protrusions can be undetectable unless a physician spots the condition. Often, people discover small hernias in the diaphragm when a doctor is examining them for other problems. Large hernias, on the other hand, are readily apparent and some require surgery. In addition, a larger hernia can cause stomach acids and food to travel up into the esophagus. 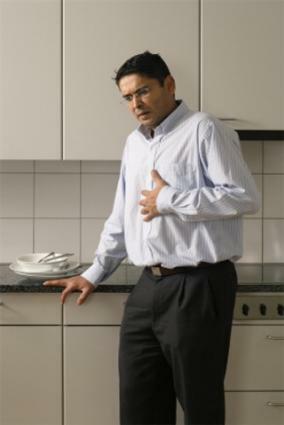 Acid in the esophagus can lead to discomfort and heartburn. Treating the condition involves making lifestyle changes, including adopting a diet for hiatal hernia. These foods can aggravate acid reflux and related conditions. However, it may not be necessary to cut the foods out of your diet completely. Different foods may aggravate one person's condition while not affecting another person at all. Keeping a food diary can help determine which foods trigger the symptoms of hiatal hernia. A diet for GERD is a great approach that offers relief from many of the uncomfortable symptoms associated with both hiatal hernia and gastroesophageal reflux disease. Acid reflux diets can effectively keep the stomach acids from building. Alkaline diets for Crohn's disease keep acid levels in check. A bland diet menu may not be necessary but some people with severe symptoms may want to consider this option. No scientific evidence suggests that a bland diet can help to decrease the secretion of gastric acid. However, some patients may find relief from their condition if they stick to this type of program. Each diet should be catered to the individual with the help of a nutritionist or doctor. Drink water 30 minutes before eating, and avoid drinking during meals. Eat small meals. Some suggest cutting portions in half, creating six small meals rather than three large ones. Do not eat before lying down. Try to avoid consuming foods for at least an hour before bedtime. Add antacids into treatment for heartburn symptoms. Wear comfortable clothes, and nothing that is tight around the abdomen. Avoid bending over after meals. Avoid engaging in activities that cause strain to the abdomen. It is important to note that roughly half of the people who have hiatal hernias do not experience symptoms, and many of the symptoms mimic other health problems. Make sure to get regular checkups with your physician in order to get a proper diagnosis. Before starting any diet or exercise program, it is critical to discuss the available options with your doctor. Any changes in lifestyle should be discussed as well. Your physician can offer excellent advice that can help determine which dietary choices to make.